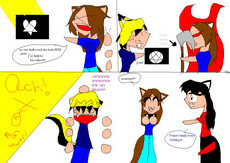 some random crap about me, i like: The Cheshire cat (disney's,Carrol's and Mcgee's), Alice (i like Mcgee's best),drawing,music,singing (not in front of people though),Chocolate,video games American Mcgee's Alice is the best thing since sliced bread in my opinion, beaten it atleast 5 times,Sonic the hedgehog,Inu-Yasha,Trigun,Wolves rain,pocketwatches (shiny! ),Tea,animals,mah fwiends,mythology, HIM!!!! NOTE: LADY_AYAME316'S FAC ACCOUNT WILL NOT LET HER LOG IN! AND MY FAC WILL NOT LET ME SUBMIT ART! HIM IS INDUSPUTABLE PROOF THERE IS A GOD!!! THERE IS DIFFERENT STUFF THERE. i might come back when i want to IF i want to. I have requested that you delete any pictures of my characters due to character theifs, please do so. so please come and visit me at my DA acount! thanks 4 your sweet friendship!! !